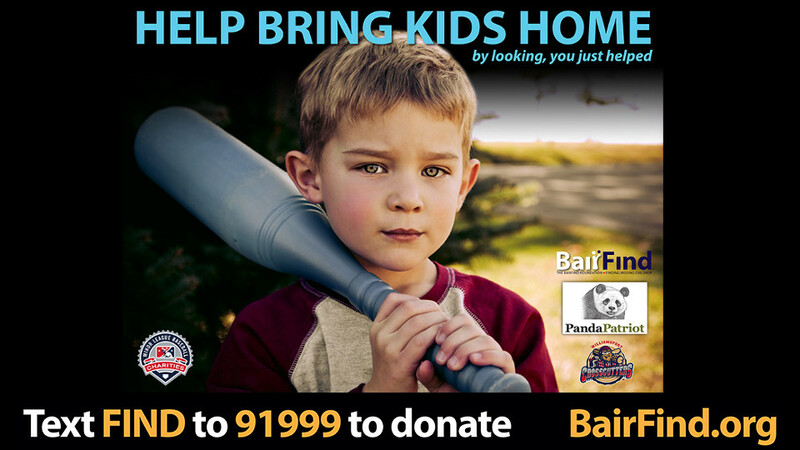 The BairFind Foundation is proud to announce a continuation of their partnership for the 2017 baseball season with The Williamsport Crosscutters of the New York-Penn League, this year joined by Panda Patriot Power in the ongoing search for missing children. Panda Patriot Power has sponsored this year's BairFind sign featuring area missing children that the Cutters place on the stadium concourse for all the fans to see. The BairFind Foundation is a 501(c)(3) nonprofit organization with a mission to find missing children. BairFind produces high definition, colorful and attractive signs for sports stadiums, arenas and other venues that feature photos of each city's missing children, reaching millions of people annually across the United States and greatly increasing the chances that featured children will be safely located. BairFind was founded in 2010 by former Williamsport pitcher Dennis Bair, and has been supported since its inception by Doug Estes, Gabe Sinicropi and the front office of the Williamsport Crosscutters. "A major challenge for a family with a missing child is how to keep their loved one's photo in public view. By partnering with the Williamsport Crosscutters, Panda Patriot Power and Minor League Baseball, we are providing a valuable and necessary service to Pennsylvania's kids and their families at no cost to them. This summer, Williamsport fans will be instrumental in the search, thanks in large part to the generosity and sponsorship of Panda Patriot Power," said BairFind Founder Dennis Bair. Cutters Vice President of Marketing and Public Relations Gabe Sinicropi stated, "As soon as Dennis contacted us in 2010, we knew we needed to help out. How could you not? From putting missing children on our team photos to posting signage in the ballpark, we have seen BairFind grow and the number of teams participating increase exponentially. When they were looking for sponsorships to help further their mission, Panda Patriot was the first company we thought of. Their commitment to Cutters charity initiatives is second to none." The Williamsport Crosscutters are a short-season Class-A affiliate of the Philadelphia Phillies. The Crosscutters home ballpark, BB&T Ballpark at Historic Bowman Field, opened in 1926 and stands as the 2nd oldest minor league stadium operating in America. Over 560 players who have worn a Williamsport professional baseball uniform have gone on to play in Major League Baseball, including hall-of-famers Jim Bunning, Bill Mazeroski, Jim Rice & Nolan Ryan. Former alumni currently playing in MLB include Jose Bautista and Andrew McCutchen. Panda Patriot Power is the newest combined cycle natural gas plant in Montgomery, Pa. just outside of Williamsport. Panda Power develops, owns, operates and manages investments in clean energy. Panda has five combined-cycle power plants in operation in Texas and Pennsylvania, and two combined-cycle power plants currently under construction in Pennsylvania and Virginia with a combined capacity of more than 5,800 megawatts. Panda Power also has a 990 megawatt power project in Maryland in advanced development.